It almost came too easy for the Lovell Bulldogs Friday night as they steamrolled the Pinedale Wranglers 55-31 in their home and 2A West Conference opener. In yet another case of the final score being deceiving, the Bulldogs led 41-0 halfway through the second quarter, and coach Doug Hazen substituted liberally after that as the Lovell JVs and freshmen battled the Pinedale varsity for the rest of the game. Lovell senior Dino Collins powers for a touchdown against the Pinedale Wranglers Friday night in Lovell. 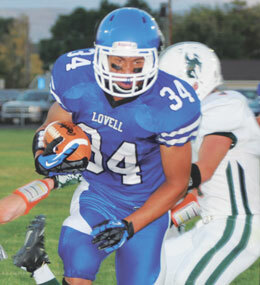 Collins scored four touchdowns in Lovell’s 55-31 win. Ever the perfectionist, Hazen said the Bulldogs still have work to do in order to be the kind of team they want to be, noting the first offensive series when a halfback pass was wide open, though it fell incomplete, and a fake punt went for 22 yards though it was called back on offsetting penalties. “We’re going to play a team this week that will make those plays,” Hazen said of this week’s showdown in Lyman. “There’s still plenty of room for growth by our guys. We have a great group of kids, but we’re not perfect by any means. Special teams were, well, special on Friday as the Bulldogs ran both a kickoff and a punt back for a touchdown. Senior Nathan Grant went 85 yards on the opening kickoff, and senior Dino Collins added a 58-yard punt return for a touchdown in the second quarter. Grant’s return on the first play of the game gave Lovell a 7-0 lead 13 seconds into the game, and after a Pinedale punt, the Bulldogs scored again the second time they touched the football when Collins, who decimated the Wranglers Friday, powered through traffic to the right side and tight-roped his way downs the home sideline for 51 yards and a touchdown. Lovell led 13-0 after the PAT missed. Junior Hyrum Hopkin ended the next Pinedale drive with an interception, but three holding penalties on the ensuing series prevented the Bulldogs from scoring despite a 26-yard completion from Dylan Hultgren to Cody Savage and a 21-yard run by Collins. The third penalty wiped out a touchdown pass from Hultgren to Grant. Following a Pinedale punt and a 27-yard return by Collins, the Bulldogs quickly drove to the 11 on a 12-yard burst by the senior. A fumbled exchange from Hultgren to Collins gave the ball to the Wranglers, but they fumbled it right back. Grant gained 14 yards to the four, and Collins scored on the next play. Lovell led 20-0 after the first quarter. When the Bulldogs weren’t hurting themselves, the Pinedale defense could do little to stop them defensively. On Lovell’s first series of the second quarter, the Bulldogs scored in two plays: a 17-yard pass from Hultgren to Ryan Clark and a 31-yard run by Collins. Collins scored his fourth touchdown of the game on the next Pinedale punt, shredding the Wranglers for a 58-yard return, and after an interception and 35-yard return by senior Austin Ellis, the Bulldog wrapped up the first-half outburst by scoring on a 20-yard TD pass from Hultgren to Savage, who broke tackles to reach the end zone. Lovell led 41-0 with 7:28 to go in the first half, and Hazen started substituting, inserting sophomore Seth Kite at quarterback and junior Calin McArthur and sophomore Aaron Monterde in the backfield. With 1:26 to play in the half, Pinedale senior Kyle Mivshek went down with a head injury, and with Pinedale officials and, ultimately, Lovell medical personnel being extremely cautious and taking their time, referees declared that the game had reached halftime, and both teams went to the locker room. Mivshek was taken to the hospital. The combination of the Pinedale varsity operating against the Lovell second- and third-team defense produced a scoring onslaught for the visitors in the second half as Pinedale scored 31 points on a 30-yard pass, a one-yard quarterback sneak, a 31-yard field goal, a 31-yard run and a 30-yard interception return. Lovell’s JV offense produced two touchdowns on a 70-yard burst by the speedy McArthur, after which Kite hit Dylan See for two, and a 46-yard run by Jeff Jameson after a recovered fumble. The Bulldogs finished with 274 yards rushing on 23 carries, an 11.9-yard average. Collins had 119 yards on just five carries, McArthur 64 yards on five carries and Jameson 51 yards on seven attempts. Hultgren completed five of seven pass attempts for 76 yards. Savage caught three passes for 55 yards, Clark one for 17 and Collins one for four. Pinedale finished with 88 yards rushing on 38 carries, but the Wranglers had minus-11 yards rushing in the first half against the starting Lovell defense. Pinedale also had 105 yards passing as Brenden Lloyd completed 11 of 17 passes. Defensively, sophomore Daniel Strom led the Bulldogs with 18 points on nine assisted tackles, three solo tackles and a tackle for a loss. Hopkin added 14 points, Clark 13 and Monterde 10. Savage, McArthur, Ellis and Drake Welch had 9 points each. “One thing to take away from this game is that we do have kids who are pretty physical football players,” Hazen said. “That makes a team better. Aaron hits hard for a sophomore, and Calin had some nice hits. And, of course, Savage and others. It will be a battle of number one vs. number two Friday as the top-ranked Bulldogs travel to Uinta County to meet the second-ranked Lyman Eagles in a rematch of the 2011 state championship game. Lyman has pummeled a pair of opponents in the early season, crushing Tongue River 56-0 and Kemmerer 46-6. Hazen and his players know that the Eagles will be loaded for bear when they host the Bulldogs, having lost to Lovell twice last season in competitive games. Kickoff in Lyman is scheduled for 4 p.m. Friday.